I was introduced to the “Stars and stripes” bagel by my brother Rob, who had had one from the Bagel Factory. 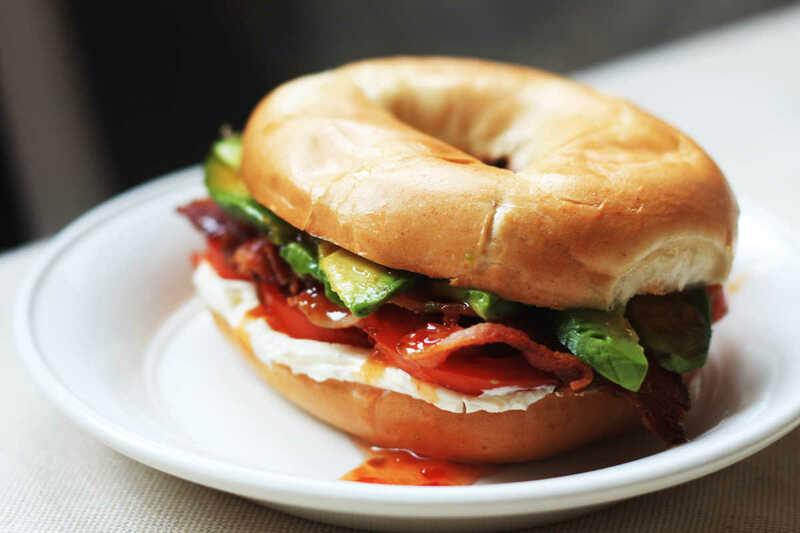 The filling comprises of bacon, cream cheese, tomatoes and guacamole. It occurred to him that it’d be pretty good with the addition of sweet chilli sauce, which he requested, and he was right! He made it at home for me a couple of times and it was excellent. So this is my homage to Rob’s improved stars and stripes, with a slight variation…instead of guacamole I just used slices of avocado and seasoned them nicely with sea salt, black pepper, olive oil and a little lime juice. Lightly toast the bagels, fry the bacon until crispy. Peel the avocado, remove the stone and cut into slices. Season the slices with sea salt, black pepper, olive oil and lime juice. Give half an avocado per portion. Layer the fillings generously, as shown in the photo.